Mezcalero biker boots made from luxurious cow’s leather, with leather inner lining and comfortable insole. They are absolutely perfect for motorcyclists. The inner area is comfortably fitted and the sole is thicker than on other biker boots. 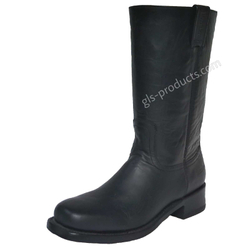 The extra soft outer leather is very comfortable to wear and is stitched to the sole via a double welt seam. These biker boots from Mezcalero boast various features that have made them particularly popular among bikers. Made from luxurious cow’s leather with leather inner lining and a comfortable insole, the inner area is extremely comfortably fitted and helps to regulate the temperature within. The sole is around 2-3mm thicker than on other biker boots and the outer leather has just a few stitches, meaning that they remain waterproof longer than other models. They stand out for their reliable workmanship and great materials, the extra soft outer leather is very comfortable and has been stitched to the sole via a double welt seam. There is currently no rating submitted for Mezcalero Biker Boots 1976.